With the unique blessing of a celestial ambassador, the PCs depart Magnimar and rush into the swamp, chasing after the mastermind behind the corruption of several of Magnimar's iconic monuments. This mastermind isn't the only one who wants to see the PCs perish in the swamp, however. If the PCs are to find the mastermind and undo these schemes, they'll need to keep their wits sharp and make the most of their newfound powers. 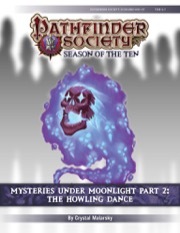 The Howling Dance is the first scenario in the two-part "Mysteries Under Moonlight" campaign arc. It is preceded by Pathfinder Society Scenario #10-05: Testament of Souls. Both chapters are intended to be played in order. So... for the first (fight against inspector Ichonvarde) and the second encounters (the chase) we had great fun. Good rp, nice inter-party dynamics, all the nice stuff. Then, enter the lurkers in twilight. And wow, this was a really bad one: while the characters were really (!) lucky with their saving throws, I still blinded one and deafened another charakter. My party had no way of counteracting the invisibility, the blindness, and they were not able to fly. It was just sad. Since I did not want to TPK at this point, I decided that after 10 rounds of basically nothing happening, that the lurkers would also leave the fight to warn their boss. At this point my players debated if they should leave the swamp to come back the next full moon. I told them that then the scenario would end immediately, so - grudgingly - they continued on. Since this frustrating encounter took so much time, I had to skip the encounter with the wolf pack entirely. Not that I missed it much. I feel that this encounter was just included in the scenario to make the +4 diplomacy against wolves useful for the players. It does nothing for the plot, the characters, or anything else. It's basically just a filler. So, my players just continued on to the Glade. We had a short break and I had everyone write down the deepest fears of their character. I narrated the voice of the haunt, and then took a few minutes for each character to describe how the haunt manifested their fear. Interestingly, my players really liked this kind of interaction. We had some really good rp moments here, and maybe even some character development. Since the saving throws against the haunt are quite easy, they were able to endure the haunt mostly intact. Finally, the characters entered the Glade. They interacted with the Tulvatha for a few seconds, then decided it was no use, and attacked. Now, do you remember the dance they were able to learn at the beginning of the scenario? The one they never really learn the purpose of? Well, a the beginning I gave them the hint that it was to be used against fear... It did not work. They never figured out how to damage the haunt, but instead continued to dance this stupid dance the whole entire final encounter... And again, since Tulvatha is invisible, immune against magic and has fast healing, this encounter would have been near impossible for my party setup. They barely got in enough damage to surpass the fast healing. Luckily most of them had the boon from Part 1, or the electricity damage would have done them in. In the end, since we were already 15 minutes over time, I decided to just forget about the fast healing, and be done with it. A little bit sad for a final encounter. - Encounter with the Lurkers in Twilight: just frustrating, they are invisible, do a ton of damage and are unreachable when they fly. The damage reduction does not help. - Encounter with the Wolf pack: has nothing to do with the scenario but is basically just there so the PCs can use the diplomacy bonus of their wolf forms. - Haunt in the fog: nice possible moment for rp. We had fun. Really rare to be able to say this about a haunt (usually when I mention haunts everyone just groans). - Encounter with Tulvatha: Again, invisibility, flying, and a ton of damage. Plus fast healing. WTF. - All in all: the first 2 encounters and the haunt were great, the rest of the scenario not so much. Feels a little unbalanced, or rather, balanced only for the right party setup. And there were just too many encounters for a 5-6 hour time slot! Like Part 1, Part 2 is fine, it's fun, it's playable, but it can't quite decide what it wants to be. It has perhaps two parts that really desperately want to be horror, to the extent that the scenario includes a disclaimer about horror. But nothing else in the scenario is really scary, and the horror just really doesn't work. You (the PCs) get to be werewolves! But sparkly silver good-aligned werewolves! I mean, that's cool. Since you're now silvery sparkly werewolves, we're fully into "let's have fun with cool stuff" territory. Because becoming a werewolf is a personal decision, it makes sense that you'd have a consolation prize for the PCs who decided not to be werewolves. The consolation prize arrives in the form of an inquisitor who Bane's vs. shapechangers, and yes, it's Ichonvarde. How he makes the leap from working with you to murdering you is unclear at best. He wasn't very well-integrated into Part 1 so a GM has to work pretty hard to play up the bits we do have to make this Ichonvarde a compelling heel. But this puts the horror conceit on even shakier footing--since we're not actually on Golarion, the anti-Varisian bigotry plays as ridiculous, possibly absurd comedy. And the other listed motivation was one line in the conclusion of Part 1 where the PCs get too much credit. Ichonvarde, for all of his motivational ambiguity, is an absolutely brutal encounter if you stand in a row and fight, and it's quite well set-up where a number of abilities related to the forest or being lycanthropes could come into play and make the PC's lives easier. The chase is fine, really. It's sort of thematic but not really. Chases don't lend themselves to horror, especially not when you're the one chasing something else. The lead-in was nice if you're trying to make things scary, but that's about it. Your opponents and the scene are sort of fun and sort of thematic but not so much that they add to anything. They don't detract from it either. But opening with Blindness/Deafness, really? Really? I was running this in convention slots and I broke tactics because there's no way this one goes quickly if any of those SLAs land. They already get invisibility or blur unless the PCs make use of countermeasures. Not to mention that they can't really do damage unless they're invisible or flanking, and it's just an exercise in frustration. You need some way to show your connection to wolves, so this encounter makes the cut--I think it works really well with the scenario, actually. And the undead wolf isn't particularly scary, but it's absolutely fitting--it's a shame this is the optional encounter! If you ask me, you should always run with this and skip the next interstitial encounter. I'm so conflicted. I mean, I love love love horror. And taken in isolation, this is a well-written horror encounter! But nothing in the scenario really builds up to this. It's just all so different from anything that's happened here. The haunt asks for your deepest fears, but why? What led up to this? The PC's fears don't play into anything else before this. The tone is just so completely dissonant. And then there's the horror warning? The warning that's hardly made it into any other scenario, it appears here? It's just so bizarre. I can see why it would have been included at one point, because it does lead into the second encounter, but in the scenario's current configuration it should have been the optional in my opinion. It's nice that you get a lot of advantages for being a wolf! This encounter is interesting and appropriate and occasionally difficult. I had no problems here. I do actually like the scenario all right, but the parts don't fit together well, like three or four different ideas are all smushed together into one fun but ill-fitting scenario. Great mod to run if you want your players to rage quit PFS. Two encounters that aren't just tough, but are frustratingly tough unless you have the right party makeup or have spent all your prestige on contingency consumables. Unlike the first part of this adventure, which had a lot of investigation and role-playing with some tough encounters, this adventure is a straight series of draining encounters. The adventure starts by giving you what appears to be some very useful buffs but they turn out to be more useful in the easier encounters than the tough ones you really need them in. The first encounter is fairly straight forward combat. This is followed by a by-the-book chase encounter. Which is immediately followed by one of the most frustrating encounters in PFS. The party faces an equal number of monsters (at high tier, half at low) that all start by casting Blindness. Since they start well hidden, have a limited form of Greater Invisibility and high initiative, it is likely they will get this off before most PCs can act. They follow this up by making fly-by attacks against blind PCs using sneak attack with poison weapons. And if you happened to have made your save against the Blindness or have a means of removing it in combat? Well they can each cast blindness 3/day. You’d think the Scent ability the mod gives you would be useful, but because it takes a Move action to locate a target and the monsters are constantly changing position, it isn’t. Assuming you survive this encounter, since Blindness is permanent, and returning to town would end the adventure, blind PCs remain so for the rest of the adventure, making them frustratingly useless to the player. Even if you have some means of removing blindness, it is unlikely you will have enough for the whole party. The next encounter can be won in several ways, that include non-combat. This is followed by a nasty haunt. And then the final encounter. The boss is yet another flyer you can’t see. It is also immune to most magic and has a ridiculous AC (including Touch AC), and the mod gives it several forms of fast healing. But at least the mod warns you about what you are up against before you even leave town. It is bolstered by yet another Haunt and damaging terrain hazards. The nature of the second and final encounters makes them both very frustrating (and deadly) if you don’t have multiple means dealing with invisibility, a dedicated healer and possibly copious castings of Magic Missile. Party makeup and copious contingency consumables will spell the difference between a tough adventure and a frustratingly deadly one. Making this a poor adventure for the unpredictable environment of organized play. Good scenario, level 6-7 can be tough! Well written and some really tough combats for the high tier. Fun to run and the players had a good time. At least it's not the Irespan! 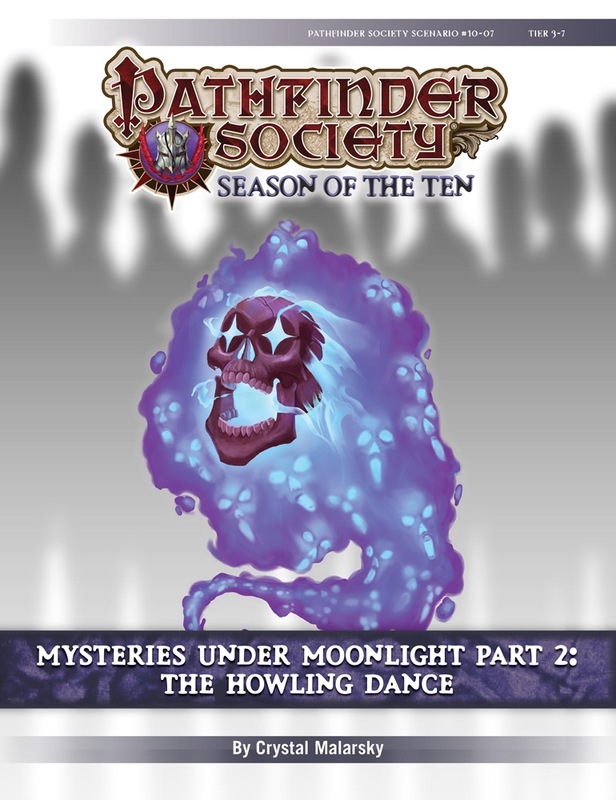 "The Howling Dance" is the second scenario in the two-part "Mysteries Under Moonlight" campaign arc. Oooh sounds like rougarou stuff!